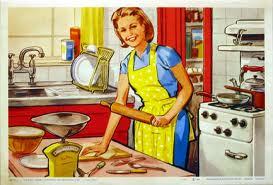 Tips on cooking, baking, sewing, and crafts. I would like to share my story with you regarding my experience with diverticulitis surgery and in the hopes that it might help someone who is going through the same thing or maybe nervous waiting to have surgery. I had been dealing with diverticulitis for the past ten years off and on. And “boy it’s not fun”. In and out of the emergency room, X-rays, blood drawn, drinking that nasty chalking stuff, antibiotics, etc on and on. So, moving forward, I had an attack at work one Sunday morning, and of course, I had to leave work and go straight to the ER while thinking in the back of my mind “here we go again”. With the attacks in the past I had no infection which was a good thing, but not so much this time around. People were coming in and out of my room drawing blood, X-rays, and running other tests that I never had in the past. I then start to get a little nervous and thought to myself there is more going on here then I know right now. The doctor explained to me that the surgeon on duty would be seeing me due to an infection. I said to myself “infection” I’m in trouble now. At this point I was really getting concerned and nervous and my mind was racing and saying what about if it’s this or that. Of course thinking the worst. Eventually, the surgeon came and spoke with me and explained that I had an infection and would need to be admitted to the hospital to be watched closely. He said I was not out of the woods yet and may need to have colon surgery. And of course I said “colon surgery”. I did not know what to think next and everything was happening so fast,and then I was taken upstairs to a room and once again the reality hit me. Thinking in the back of my mind “am I really going to have to go through colon surgery and if so will my whole colon be taken out and have to live with a bag the rest of my life”. You want to talk about scared. So as you can imagine I could not sleep knowing what I might be facing in the coming days. Turns out the antibiotics and rest got me over the hump and I was beginning to heal on my own. I was discharged from the hospital several days later and rested at home for sometime before returning back to my job. Meantime I had to check back with my surgeon to see how things were going and to discuss possible colon surgery “again”. He discussed the option that I had. The first was to wait and see if I have another attack and the possibility of having to remove the colon, or go ahead and plan the surgery now. I decided to go through with the surgery then wait until another attack and have to have the colon removed. The surgeon told me up front everything I needed to do before surgery so that I might have a better shot with not having to have a bag the rest of my life. Although nothing is for certain when in situations like this. The nervousness was kicking in big time the night before the big day, and could not get much sleep. We arrived at the hospital really early and had to wait until they called my name and I was beginning to feel sick and everything else. Finally, they took me back and got me ready for surgery and the next thing I know it’s that time. In one way it was a relieve and another not so much. The biggest part was I did not want to have a bag the rest of my life. Surgery went for several hours and everything came out well. Guess what “no bag” LOL. My recovery went well and only needed to work with physical therapy for a few days and walked the halls everyday. I had a big support group behind me all through the process. My coworkers were so sweet to come visit while in the hospital. My son from Maryland flew in to visits me along with my mother. Of course my husband was by my side as always. In closing, I would say if anyone is having to think about colon surgery to be sure to do your homework and research and ask your surgeon a lot of questions because in the end it’s your body. How is everyone this morning? People have been sending me messages asking if I am ok. Let me begin by saying life has thrown some curveballs this way and trying to make some adjustments. I just keep trying to hit that ball and not give up. Anyway, I had some time to sew. I belong to a private group on Facebook and we have things in common such as: quilting, sewing, crafting. Instead of our regular swap this month we decided to sew Little Dresses for Africa. Sew of course, I jumped right in and made two dresses and loved the way they turned out and were so easy to make. I wish time had allowed me to make more but was not able to. So far the group has been able to complete 150 dresses. How awesome is that! Wish I could see the little girls faces when they receive the dresses. I would like to especially thank Kelley for all of her hard work lining up the swaps each month. Below is a picture of one of the dresses I made. However, I forgot to take a picture of the second one I made. Lol. If you are in our groups leave a comment below and tell me what you enjoyed most when making the dresses. Feel free to post a picture of the dresses you made. Guess I will sign off for now. Take care and until next time, Happy sewing!!! With my crazy work schedule I finally got to spend sometime sewing this weekend. 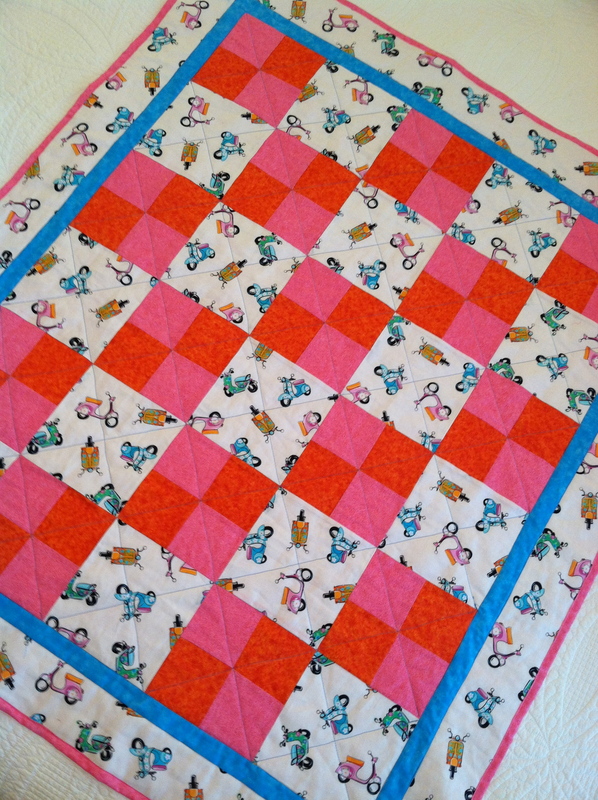 I currently belong to a private group on Facebook called ” Crafty Gemini’s Crafters” and we share different ideas and ask questions about anything from sewing to quilting. 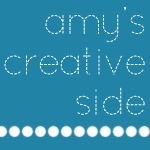 So if you are into sewing or quilting this is the perfect group to join. Within the group I noticed people posting pictures of these pretty baskets and thought I would give it a try. It was very easy to make and does not take a long time to make. Here is the link to the tutorial for the 1 hour basket. 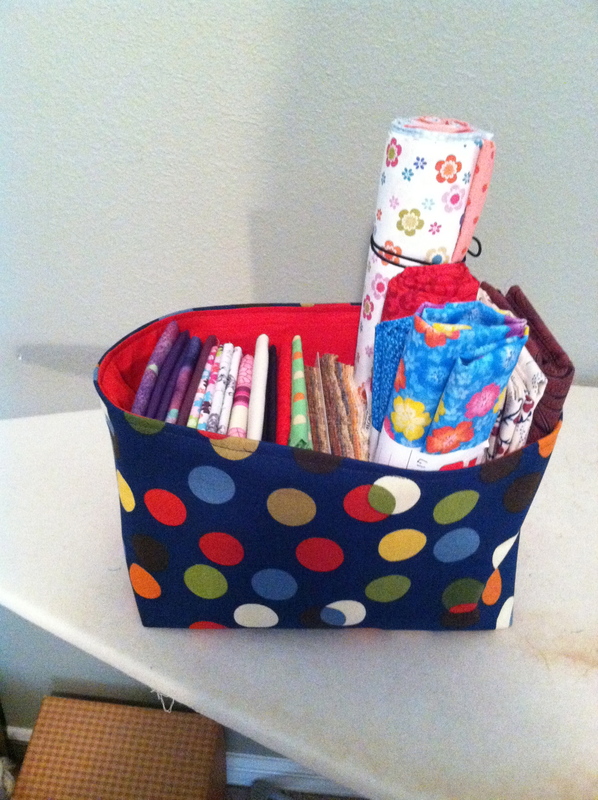 I made the basket with home dec fabric along with interfacing to the exterior fabric. Doing so the basket will hold its shape. Also, I did not add handles to the basket, but next time I think I will add them. Well thats it for now! Everyone have a great week and have some fun along the way. Sew what does one do when the weather is cold down here in Tampa? I decided to make a lined zipper pouch and I was definitely pleased with the result. The pouch was easy to make and I even plan to make more when I get time. Rather then have the bag look flat I added boxed corners which also help the bag stand up. 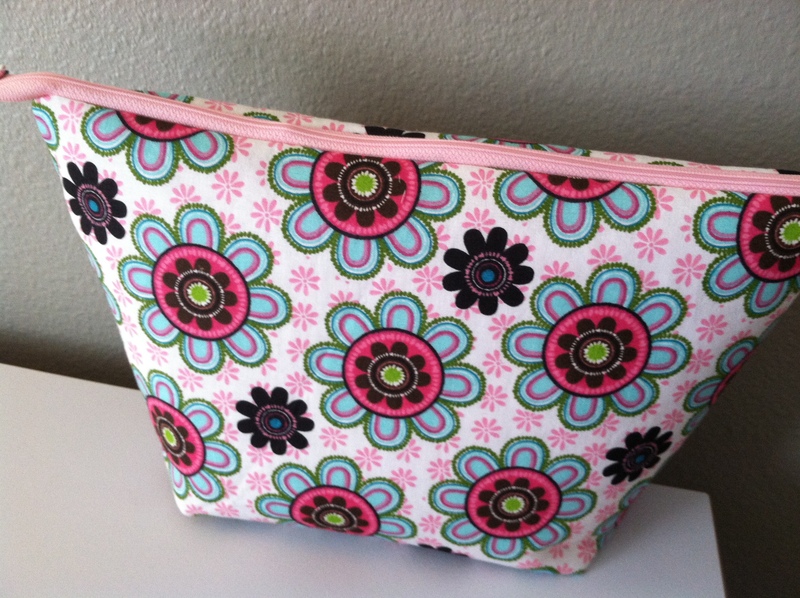 So hop on over to Crafty Gemini and watch her video and make yourself a bag. Hello there my favorite peeps! 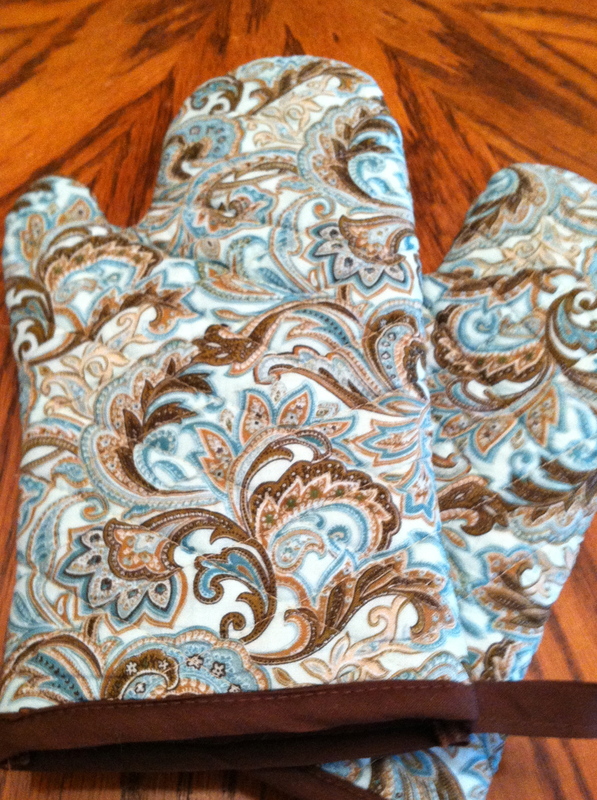 I joined Crafty Gemini’s Crafters on Facebook the other day and found a tutorial for oven mitts. After watching the tutorial I decided to give it a try. As I began quilting the oven mitt I had issues with the fabric puckering and decided to start over. 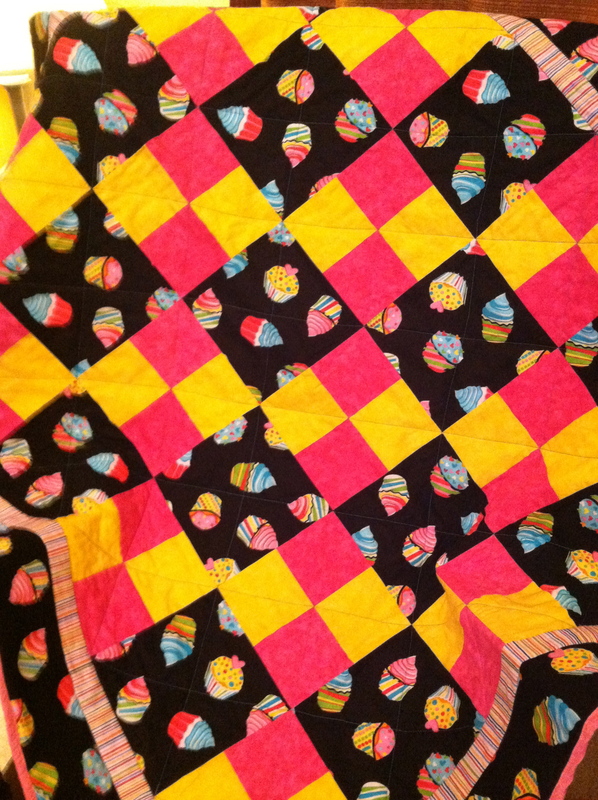 So I made a quilt sandwich and did not have any issues with the fabric puckering. I did make some changes myself such as, making a quilt sandwich, added 100% cotton batting between the two pieces of fabric. I placed the oven mitt pattern on top of the quilted sandwich and cut the pattern out. Added some bias tape at the bottom of the oven mitt. These oven mitts are easy peasy to make and excellent for a gift too. Feel free to leave a comment or share any ideas. 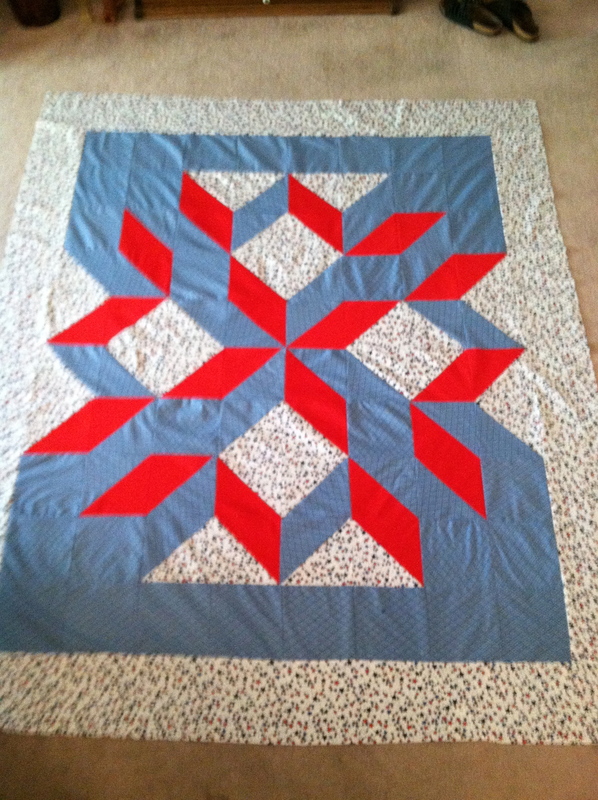 Our quilting guild got together and decided to make some quilts for a charity Quilts of Valor. We had a lot of fun sewing a new pattern and knowing a wounded soldier would receive a quilt for comfort. Be sure to check out their website. There are many patterns you can choose from on their website along with directions. 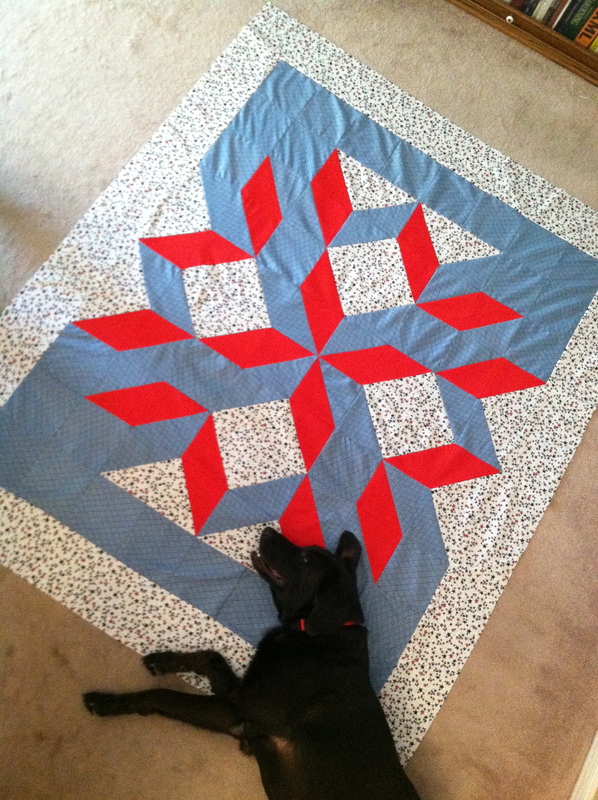 Apparently, Buddy thinks the quilt is for him. LOL!